After a difficult couple of weeks at work my fiance recognised that I needed a spot of bibliotherapy. And so yesterday morning he suggested a trip to Redruth, home of Cornwall’s largest secondhand bookshop which has proved to be a very happy hunting ground for me in the past. I readily agreed, and off we went. But when we arrived the shop was shut. We were in normal opening hours, there were no notices except the one that shows opening hours, and yet there was no sign of life. peering through the window, we could see that inside some books were still on shelves but others had been boxed up. I’ve sent an email, and I’m keeping my fingers crossed. We have already lost one shop in my home town, one in Helston, and two in Falmouth over the last few years. I’m doing my best to keep Cornwall’s secondhand bookshops in business, but I can’t do it alone! We were disappointed, but we pressed on, seeking out lost gems in the market and the charity shops. We found lots of books, but nothing that either of us wanted. But eventually I struck gold, in what I can only describe and a dark and dusty emporium, selling all kinds of everything. On the right hand wall were bookshelves, full of tatty, aged books. And among them I found some gems. I have heard much praise for Richmal Crompton’s novels for adults. Sadly though, with the honourable exception of Family Roundabout, which has been reissued by Persephone Books, they seem to be as rare as hens’ teeth. So when I saw this little volume from the 1920s I pounced, even though I know nothing about it. 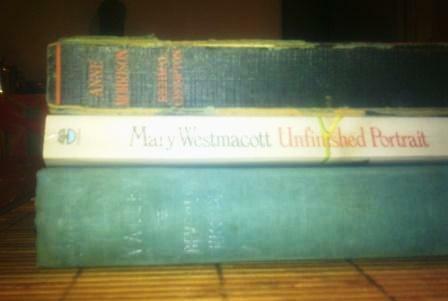 After I read Laura Thompson’s autobiography of Agatha Christie a couple of years ago I was very curious to read the romantic novels that Mrs Christie published under the name Mary Westmacott. They were out of print, the library couldn’t help, and so is I let it go – but when I found a 1960s paperback for a mere 85p I had to pick it up. The lettering on the spine had nearly disappeared, but there was just enough left for me to spot that this was a book by Beverley Nichols that wasn’t in my collection. And when I opened it I found beautiful illustrations by Rex Whistler that would have been worth the asking price even without the writing of a beloved author. Three wonderful books and a spot of lunch saved the day! We returned to the car park in good spirits, and in good time to be home for low tide and take Briar down to the beach. And then the car wouldn’t start. Fortunately we had plenty of reading material while we waited for the man from the RAC. He saved the day, Briar had her walk before the tide came in too far, and then I retired to the sofa to contemplate my books. Not quite the day we had planned, but a lovely day nonetheless. How sad about your favourite bookshop! Hopefully there is just a change in ownership or something, and it will remain a bookshop. But good news on the acquisitions made elsewhere. The shop is still on ABE, so I’m hoping the owner is refurbishing or moving, but I suspect she might be doing what a couple of the other lost shops have and going internet only. Better than nothing, but you can’t rummage in the same way and find those books you hadn’t thought of looking for. An all round lovely post. So sad about closing bookshops in Cornwall though. It is sad, but there we do have a few shops left. Newlyn Books is sill trading in town and the St Just Cafe Bookshop is well worth a visit if you are ever down this way. Poking around in an antique bookshop sounds like an ideal day to me! I look forward to hearing about Richmal Crompton, I just received Family Roundabout in the mail and look forward to reading it. And I’m crossing my fingers about your favorite bookshop, I hope it hasn’t closed. I really couldn’t believe that I found an adult Richmal Crompton novel. Our local Oxfam shop has a William book on the shelves, and every time I see it there’s a moment’s excitement, followed by disappointment. Oh no, I hope the bookstore is just moving. I’ve sent the owner an email and I’m keeping my fingers crossed. I have been looking for Richmal Crompton’s books for quite a while now. Her children’s books were available in the Melbourne library but nothing else. Now I will look in Sri Lanka (the second hand bookshops will definitely have something). Beverley Nichols is new to me but I will be keeping an eye out for this as well. Even in a good area for secondhand books its taken me a long time to find a grown up Richamal Crompton novel. And I’m afraid Beverley Nichols is out of print, but he was very successful in his day and wrote a lot of books, so hopefully something will turn up for you, or maybe be reissued, one of these days. I called in at this shop last September on my way back from Cornwall and although I did buy one book, I thought it was very gloomy and had that ‘books graveyard’ feel which just doesn’t welcome casual callers. I’m sorry if it’s closing, but not really surprised. On the same trip I found really good shops in both Launceston (tucked away a bit) and Truro (in Pydar Mews). Both were light years better than Redruth in terms of visually welcoming me in. My two favourite Cornish bookshops are Bookends in Fowey, where the owner is a delight and the Cookbook in St Just (‘turn left at the clocktower’) which is also a great little cafe. I visit both whenever I can get to beloved Cornwall – and usually call into Dartmoor Books in Ashburton on my way down (I live in Bath). I can only guess that you hit a bad day in Redruth, because whenever I’ve been there the owner has been friendly without being pushy. Yes, the other shops you mention that I know have more obvious attractions, but they have the advantages of being in wealthier areas that see many more visitors (except maybe St Just, which is heavily subsidised by the cafe and donations) and charging much higher prices. How frustrating – but it sounds like you got the therapy you needed in the end. Days out are so very cheering. And what a find with that Richmal Crompton – her books are really wonderful. Oh dear, the feeling of disappointment when you tug on the handle of a bookshop’s door to find it locked. All the best on hearing back, hopefully they are just moving to a new location…a larger one! Your fiance sounds like a lovely and thoughtful person. Great finds in the books too! There are few things sadder than an unexpectedly closed bookshop. And yes, my fiance is lovely, thoughtful, and a fellow bibliophile to boot! Oh I hope the bookshop hasn’t closed. It’s so sad to think that so many of these independent places are closing up now. However I am glad that you managed to have a good day regardless – sometimes the best times you have are the unplanned ones! Great books – you always manage to have such luck! I hate hearing that another book seller has went out of business. Before you know it there will not be any bookstores left…even the huge ones!